The crash of falling worlds... These few words, from a poem by Janet Erskine Stuart, which came to me as I was holding the world in prayer, sum up much of how things currently feel. We have the Church, truly tempest-tossed, and the anguish, outrage and pain of Catholics across the globe, whose certainties and trust have been crashing around them. And if we look around, hoping for respite, it is hard to find. Instead, we have the rise of populism and fascism, rampant xenophobia, 'fake news' and the relativising of truth: over here we have the dangerous, unravelling mess of Brexit, while the US - and through its influence the entire world - is dominated by the even greater, unravelling danger which is Donald Trump. It does indeed feel as though our world is fragmenting, falling and crashing all around us, along with the certainties and truths on which it has been built. But that's not what's at the heart of Janet Stuart's poem - rather, it is the God who holds us, in safety and tenderness, throughout. The same God who, St Paul assures us in today's first reading, is faithful. God is faithful, he states, simply yet firmly in 1 Cor 1.9 - not will be faithful, or has been, or can be, given the right conditions, but is. God is faithful. 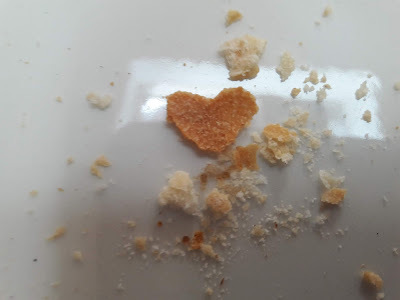 Not manufactured: the breadcrumb really did crumble into a heart shape! RSCJ make our vows Trusting in the fidelity of God and the love of my sisters... and over the years I have discovered that God is steadfast, generous, tenacious Love precisely because he is faithful. This is a fidelity which, according to our Constitutions, dwells at the very core of our weakness: that's where it has to be, because that's where it's most needed. And that's where I can believe the fidelity of God can be found as certainties, beliefs and worlds come crumbling, tumbling, crashing down all around us - at the very heart of our world and of all that is weakest and most fragmented. That is where we can find God, or at least know he is present; quietly, steadfastly, mysteriously keeping covenant. God is faithful: and in his fidelity, as he promised to Julian of Norwich, though we will be tempest-tossed and wearied, he will not allow us to be overcome. I need the faith to hang on to that promise.